While visiting my friends Jill and Matt this past weekend, I couldn't help but notice this gem of a photo hanging in their apartment. 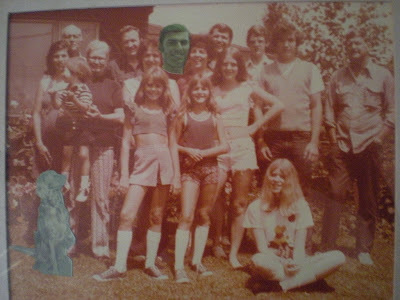 Apparently if a family member was not present for a family portrait, Jill's grandmom used to cut and paste them into the photo. If only she had experienced the magical wonder of Photoshop! I suggested Jill add a small photo of her own head to her mom's belly on the far left.